Hello there stampers! Are you ready for the brand new Holiday Catalog to launch? It's just a short time away now as September 1st is rapidly approaching! Since I was able to preorder from the Holiday Catalog at the beginning of August- I have been busy creating samples. Most of which you will be able to see for yourself at the upcoming INKredibles Holiday Extravaganza happening on September 17th in Hillard, OH. Are you interested in attending? Head on over HERE to register today! You won't wanna miss it! The fabulous Becky Roberts from Inking Idaho will be there as well! My card tonight was created from a new set called Santa's Sleigh and coordinating Santa's Sleigh Framelits. This set is absolutely adorable and will surely delight those on your Christmas card list! Don't have your copy of the new Holiday Catalog? Send me an email and I'll get one in the mail to you! Hello stampers! Have you ever used a product and liked it so much that you wonder why you've waited so long to try it? That's exactly how I feel right now! I've been hoarding these gorgeous Fancy Foil Designer Acetate sheets for months now. Today was one of the first days that I used them. I gotta say- I love them! They are so beautiful! The polka dots sheet that I used above can either be gold or silver (depending on which side you choose to display). I used gold. For some reason when I think of love I think of gold! This stamp set and coordinating thinlits bundle has been one of my go-to sets for the month of August! It's so versatile. The images are gorgeous and I love the sentiments. It is often said that a Cardinal is representative of a loved one who has passed. When you see a Cardinal- it means your loved one is visiting. I saw 2 cardinals outside the other day just sitting in a tree. They were the inspiration for my card....and the sentiment as well....Always in my heart. 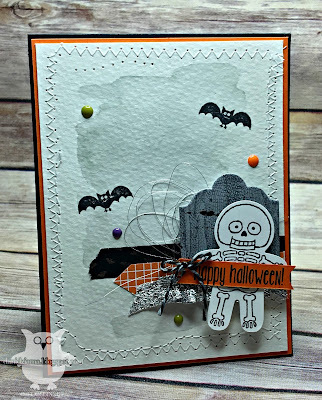 My card for tonight was created using the Jolly Friends stamp set and coordinating Jolly Hat Builder Punch. 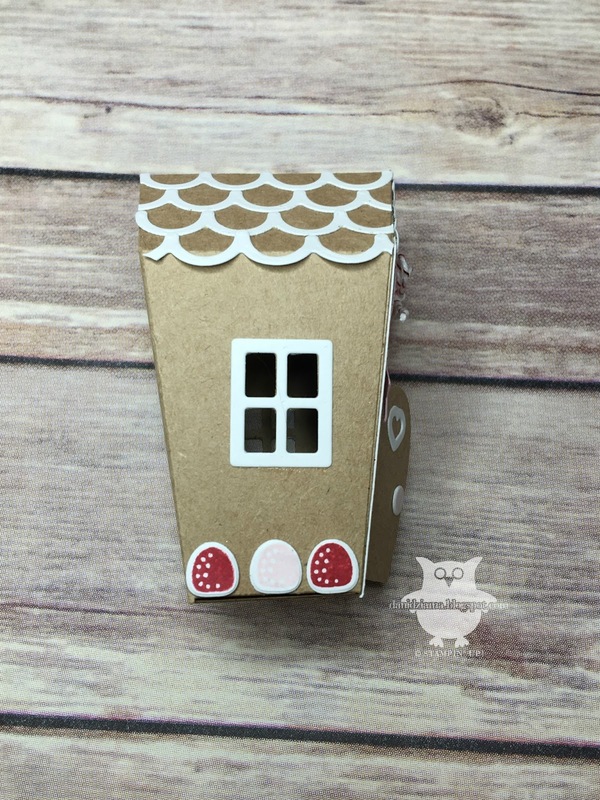 This is a super simple card to create so it's perfect for making multiples! The Mica Flakes Trio Pack are the perfect addition to the hat. The irridescent colored ones make the perfect fluff on Santa's hat! If you have never used the Mica Flakes- I strongly suggest you try some! I use the Multipurpose Adhesive to make them adhere. Please be sure to click the links below to finish the hop! You'll be happy you did! Hello! Are you ready for another sneak peek from the upcoming Holiday Catalog? If so- you've come to the right place! 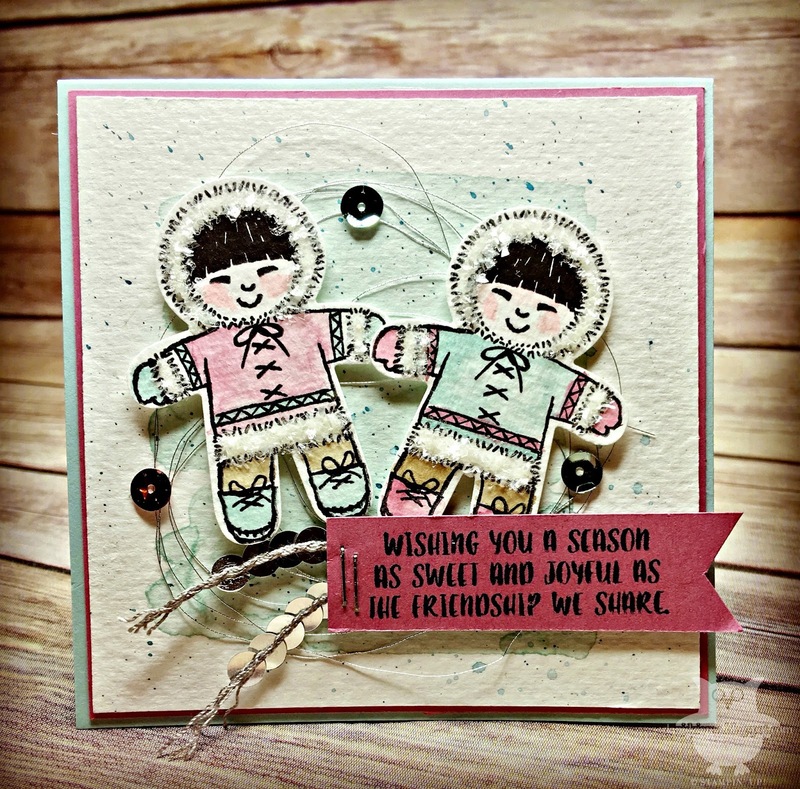 I've got an adorable card to share with you tonight! 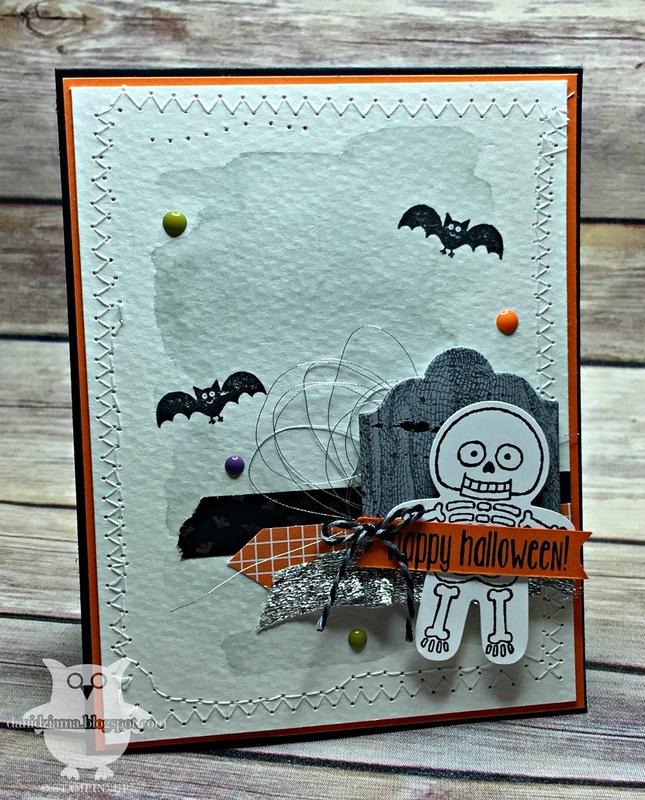 It was created using the Jolly Friends stamp set. All I have to say about this set is look at that MOOSE! He is just way too stinkin' cute! The Jolly Friends stamp set coordinates with the Jolly Hat Builder Punch. 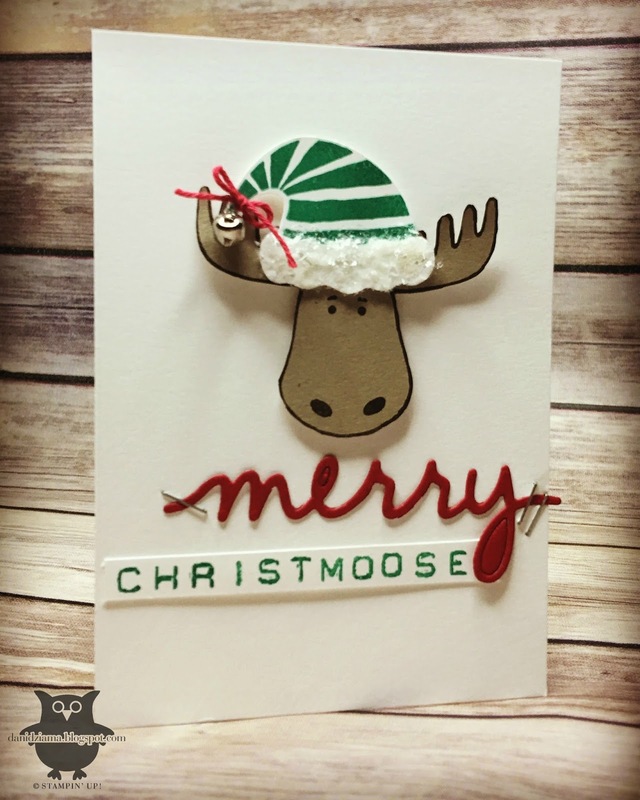 What a fun way to add that extra special touch to your Christmas cards! See the little teeny tiny bell at the end of the Moose's hat? It's a Mini Jingle Bell! Yep- those lil' cuties are in the Holiday Catalog as well! Ok. 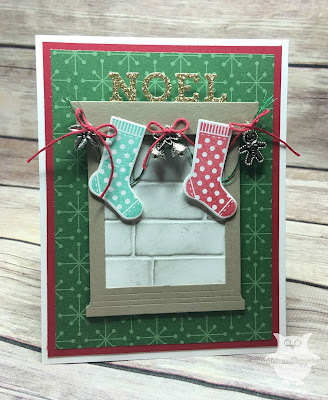 So I know it's not Christmas...but I have a gorgeous Christmas card to share with you today! 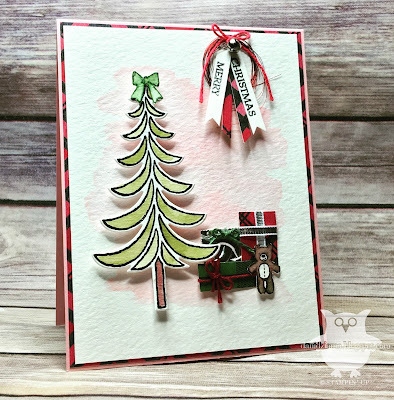 At the beginning of the month I fell in love with a tag that Connie Collins had designed for the Artisan Design Team blog hop. 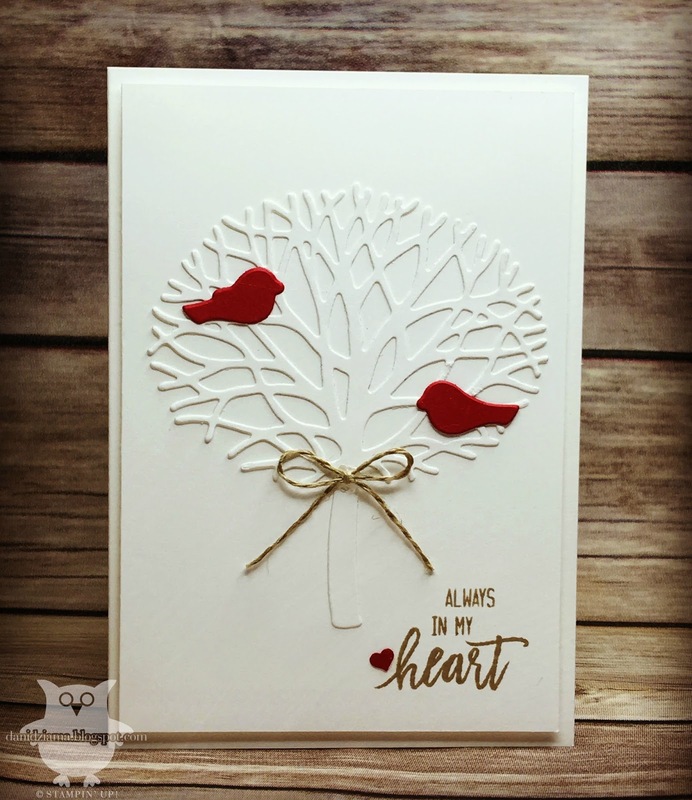 On that tag, she created a beautiful flower using the Thoughtful Branches stamp set and the coordinating Beautiful Branches thinlits. Her flower was just gorgeous and I knew I needed to create one of my own! For my flower- I stamped the leaf image in VersaMark ink onto Vellum and embossed it with Gold Stampin' Emboss Powder. I then cut each leaf out with the Beautiful Branches thinlits. I used a 3/4" Whisper White circle as the base for the flower. I then began gluing the leaves in layers until they resembled a flower. You may have noticed that my layers have a border- To create that- using Washi Tape- I taped off a square around the outer edges of my layers. I inked the edges in VersaMark ink and embossed them with Gold Stampin' Emboss Powder. Unfortunately the picture does not do this card justice. It is absolutely gorgeous in person! Oh Em Squeeee! I have an absolutely adorable card to share! 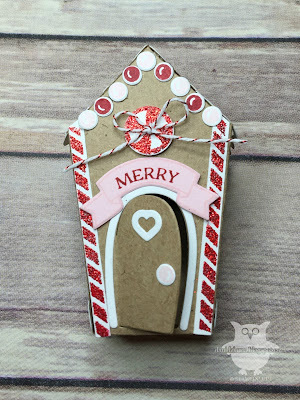 I used the Cookie Cutter Christmas stamp set and the coordinating Cookie Cutter Builder Punch. This stamp set is seriously the cutest! It's definitely on the MUST HAVE list! The image above is my favorite from the set. I love how the outfits can be customized by changing the colors! See the adorable little furry trim? It was created using Multipurpose Adhesive and the brand new Mica Flakes. WAY too cute!!! What are you most excited for from the new Holiday Catalog? I'm so excited I can't wait for you to to see the catalog and begin creating with these gorgeous new products! Hello there stampers! Once again I've been playing around with some new goodies! You are just gonna LOVE the new Holiday Catalog! It is packed with so many fabulous items that it's difficult to choose a favorite! My card tonight features the new Hang Your Stockings photopolymer bundle. The coordinating Christmas Stocking thinlits are just too adorable! Combine the bundle with the Hearth and Home framelits from the Annual Catalog- and you have a fantastic project! I love everything about this bundle! Especially the NOEL at the top of the mantle. Such a perfect addition to this card! Can you see the tiny little Christmas Trinkets? They are strung on the new Metallic Thread Combo pack. It comes with a spool of Red and a spool of Green metallic thread. 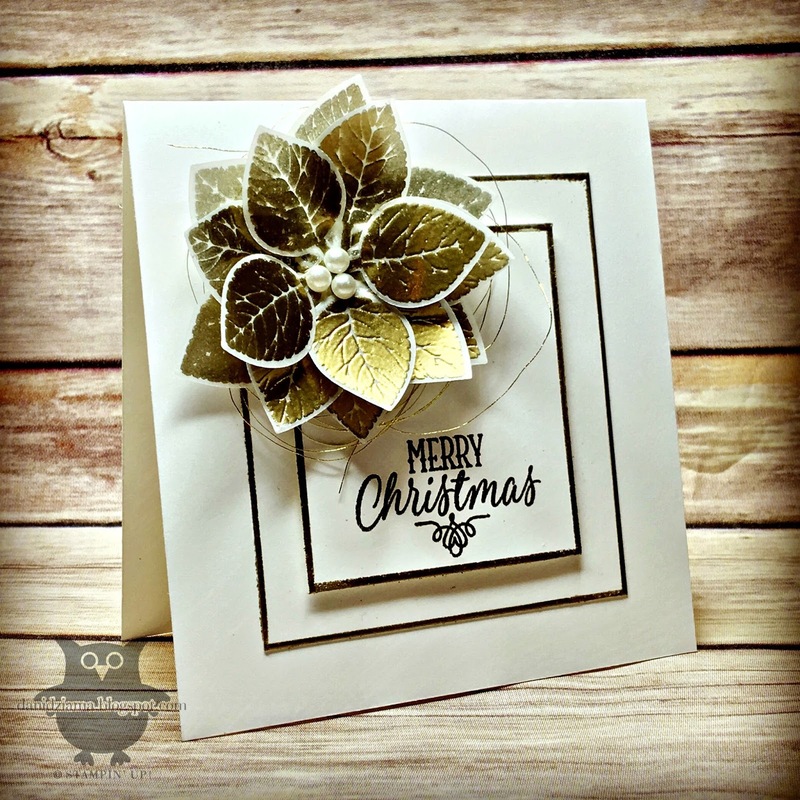 It seems that the metallic threads are some of my go-to embellishments! LOVE THEM!!! Thanks for stopping by! The supply list is below but for a few items couldn't be found in the database when I created my supply list. Those items are the Christmas Trinkets and the Metallic Thread Combo Pack. Hey there stampers! Guess what?!?! I have another SNEAK PEEK to share with you! Only tonight- it's not a card! 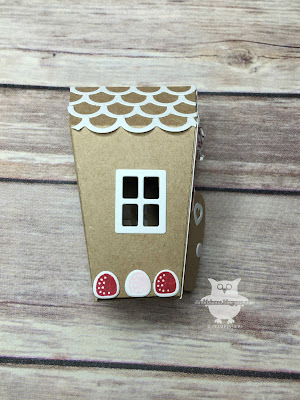 It's an adorable little house created with a new set of thinlits called Home Sweet Home. The little gingerbread house displayed in the Holiday Catalog was my very reason for buying the thinlits and the coordinating Sweet Home stamp set. Way too cute! EEK! It's official! 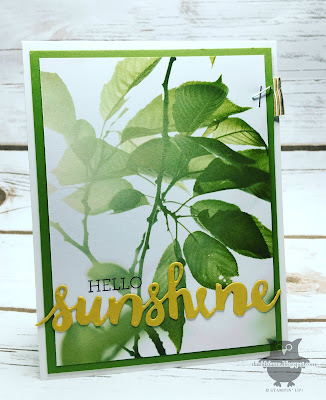 I'm totally in love with the new Stampin' Up! Holiday Catalog. I cannot wait for you see it! For as long as I can remember, Halloween has been my favorite holiday. I know a lot of people do not celebrate it (and that's OK) but for those who do- here is an adorable card. LOTS of sneak peeks here! 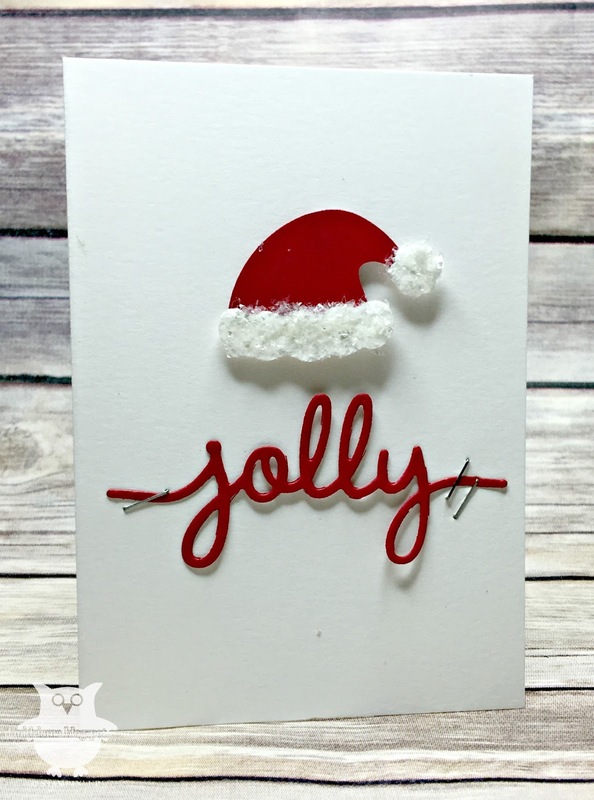 I hope you have enjoyed my card! Be sure to check back frequently as I have more goodies in store! Hey stampers! Are you ready to see a SNEAK PEEK from the upcoming Holiday Catalog? If so, you've come to the right place! I have ordered (and received) my preorder and let me tell you- it is FILLED with tons of amazing new products! My only regret was having a vacation the same day my preorder arrived! Thankfully I've got plenty of time to create and share now that my vacation is over. 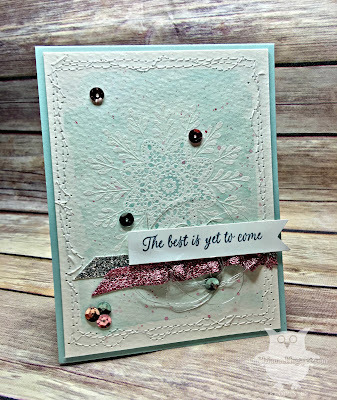 The first project I will share is a gorgeous card created with the brand new Frosted Medallions stamp set. 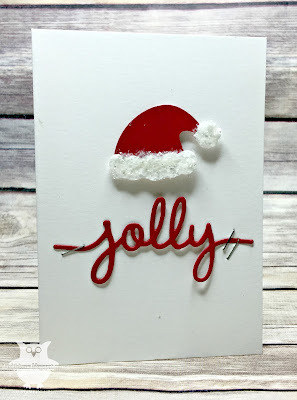 I used the Emboss Resist technique to create the beautiful background. The Soft Sky watercolor wash was applied in several layers allowing it to dry completely in-between. What do you think? Would you like to have your copy of the 2016 Holiday Catalog? Be sure to send me an email with your address and I'll drop one in the mail to you! 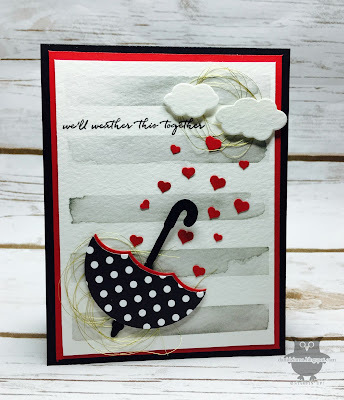 My card for tonight was created using the fabulous Weather Together stamp set and coordinating Umbrella Weather framelits. To create the background- I used washi tape to block off parts that I didn't want to be inked. Then I added a Smoky Slate watercolor wash stripes! 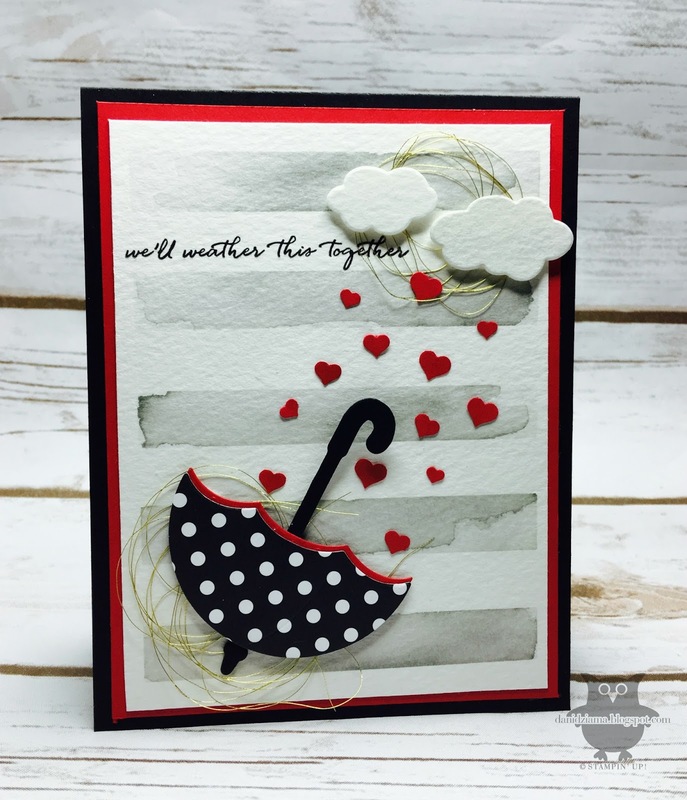 Using the Confetti Hearts Border punch- I was able to create a ton of little confetti hearts to use as rain drops. Isn't it cute? Hello there! Today I have a super quick and easy card to share with you. The Serene Scenery DSP stack is truly fabulous! These gorgeous backgrounds offer the perfect scenes for cards. Add a few little embellishments or sentiments and that's all thats needed! Super quick and super easy! Thanks for stopping by! I'm actually out of my office this weekend to allow for a little fun in Boston! 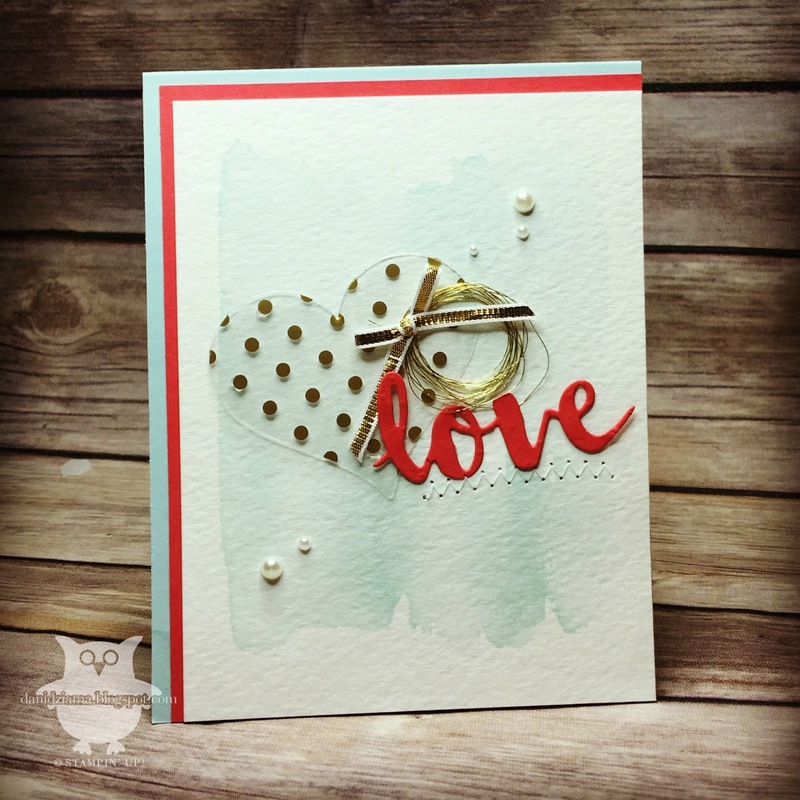 I hope you will join us on Sunday for the Monday Montage Bi-weekly Blog hop! 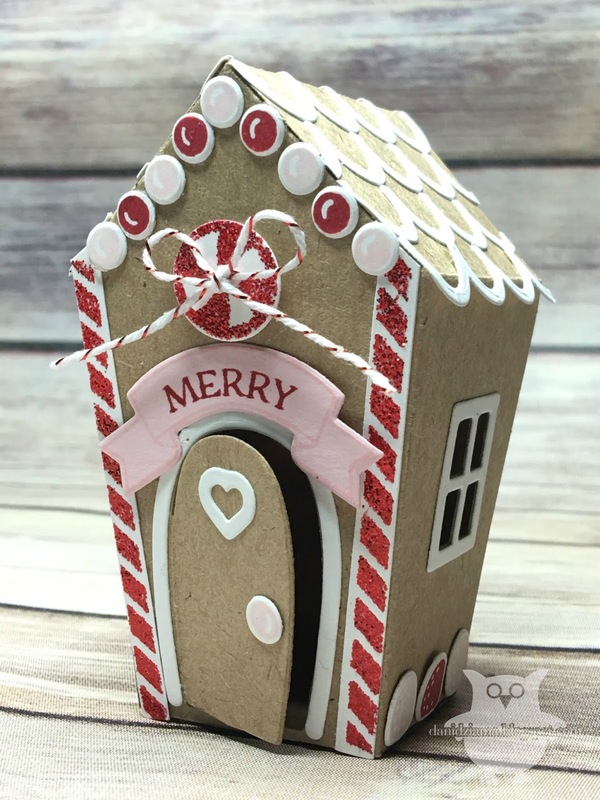 I have another fabulous card to share with you! Hey stampers! 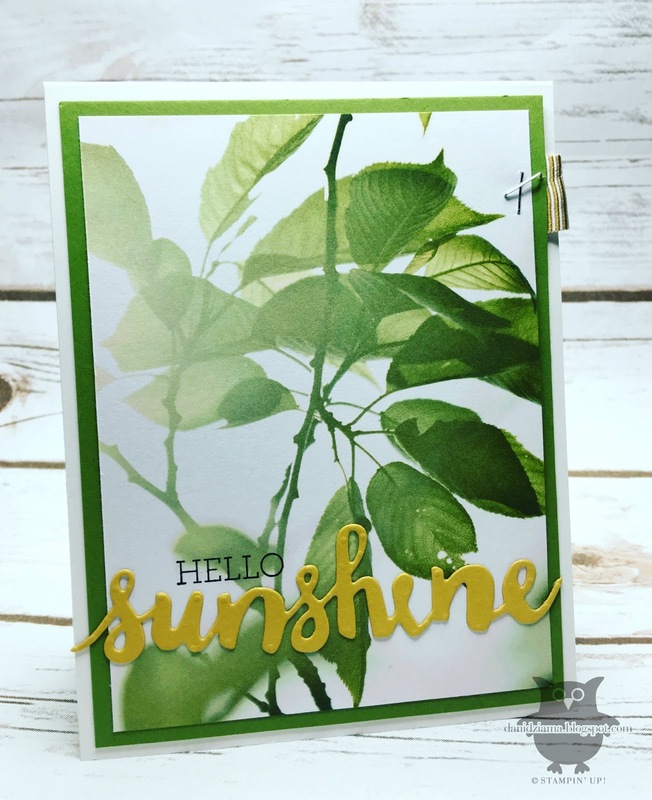 Do you ever have a great idea for a card (or any other kind of project) then when you sit down to create it- it turns out nothing like you had imagined? Well let me show you my card for today. It turned out NOTHING like I had imagined yet in the end it turned out beautifully! I was trying for a more subtle watercolor wash but the colors I had chosen were not yielding the same results as I had imagined. 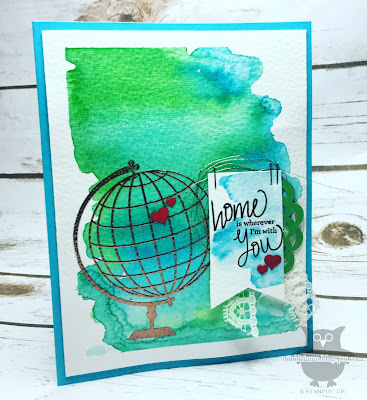 In an effort not to waste this gorgeous background- I started looking through my stamps and thought about what stamp set would work perfectly with this bright watercolor wash background. The Places You'll Go was the lucky winner! 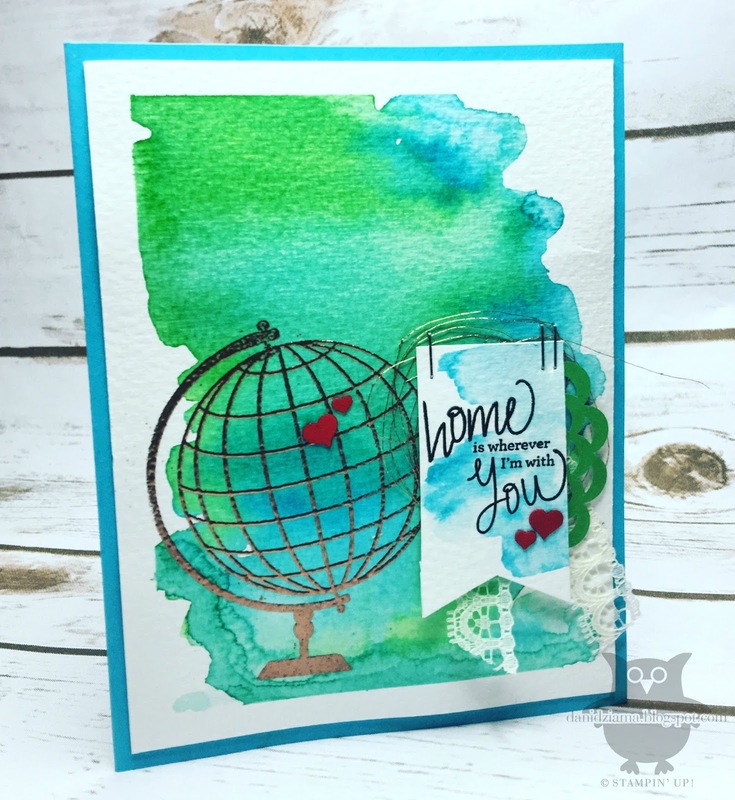 LOVE how it pairs so well with the Cucumber Crush and Tempting Turquoise watercolor wash! SO FUN!! !